“It comes in four designs, including a shark, alligator, crab, and pirate." If you’re looking for a simple beach towel that gets the job done and looks stylish at the same time, the AmazonBasics Cabana Stripe towel is a great choice. For a bargain price, you get two matching, vintage-inspired striped towels made of 100% ring-spun pure cotton. They come in retro colors like navy blue, sky blue, yellow and mint green, so they’ll look great in that next beachside Instagram. Each one is slightly oversized, measuring 30” x 60”, making them the perfect size to wrap up in or toss over a chair. While the AmazonBasics towel may not be the single highest quality towel on the market, the low price and good materials make it our pick for the best one overall. If you don’t know what you need, and you’re just looking for a great standard towel that will keep you dry and last a good amount of time, you can’t go wrong with this chic Cabana Stripe towel. Reviewers say it dries quickly and absorbs fast — and they’re soft and thick for ultimate comfort. Reviewers love how quickly the Akumal towel dries, stating that it wicks water and dries off within a few minutes. If your beach days require a lot of travel, the Akumal towel is a great choice for a fast-drying, compact towel you’ll use over and over again. Sure, sand in your toes is nice, but sand everywhere else? Not so much. If you’re tired of finding sand everywhere, The Dock & Bay Microfiber Beach Towel may be the best choice for you. This vibrant, retro towel is formulated to repel sand, making it easy to shake off and throw in the car. And if you like choices, the Dock & Bay has plenty of them—it comes in over 10 colors and three sizes (large, x-large and round). If you want a standard towel that’s easy to transport, the large works well at 63” by 31”. It’s made of microfiber, and reviewers say the Dock & Bay ​soaks up just as much water as a traditional towel. If you want a great sand-repelling towel, this trendy, eye-catching item is a great choice. 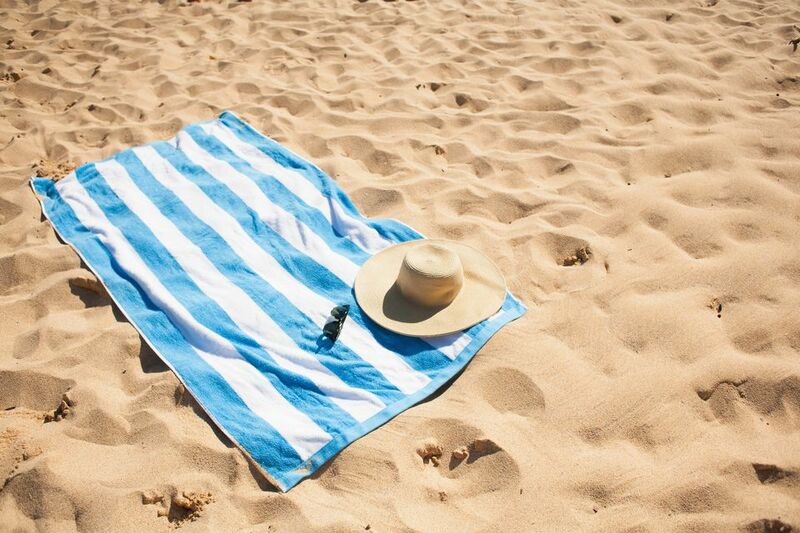 If you’re more of a traditional cotton beach towel person, this Ocean Stripe Oversized Beach Towel from Bed Bath & Beyond may be the best one for you. At 36" x 72", it’s oversized and large enough to give you room to stretch when laid out. It’s made from 100% cotton and has a soft, velvet-like feel. The nautical blue and white design is neutral enough for everyone in your family, so it’s the perfect towel to buy if you’re looking for a matching set. Reviewers love how plush the towel is, and say it’s big enough for even the largest member of their family. While some of the other towels on our list may be a little larger, we love this one if you’re looking for an oversized beach towel that will suit every need and every water activity. Convincing your children that it’s time to leave the beach can be a difficult task, but this adorable Stephen Joseph hooded towel may make drying off to go home a little more fun. It comes in four designs, including a shark, alligator, crab and pirate. Each one has different details, like fins or claws that will make your child feel like he or she is playing dress-up each time it’s used. The towel is made from 100% cotton and runs 46” by 23.5”, not including the hood. Reviewers say the size is great for children under eight years old, and rave about how quickly it absorbs water. It’s so adorable you’ll want to buy a second one for bath time. If you’re looking for a kids’ beach towel for your child or as a gift, the Stephen Joseph towel is our favorite choice. A great beach blanket is one that is not only large enough to accommodate your whole family but also dries you off at the same time. The Mad Grit Beach Blanket is 9’ x 10’ and is wide enough to hold up to seven adults comfortably. It’s made of parachute nylon, so while it’s not meant to be used solely as towel it absorbs water quickly and efficiently and can be used with or without an additional towel on top. The Mad Grit comes with a travel sack that can be used to easily store the blanket when it’s not in use and weighs just 1.5 pounds. Our favorite feature of this beach blanket is the sand pouches that allow you to use beach sand to anchor it to the ground, so you don’t have to worry about it being swept away. Reviewers rave about the Mad Grit towel, stating that it’s sand-proof and wicks water as well as any beach towel. While we’d recommend packing a few standard towels along with this beach blanket, it’s a must-have for any family that wants to spread out and enjoy the sun. A Turkish towel is a great choice for the pool or beach because it’s lightweight, absorbent and can double as a beach cover-up. The Riviera Towel Company’s Turkish towels come in nine colors and are 70” x 39”, the perfect size for any beach day. Made from 100% Turkish cotton, this towel weighs just 3.4 ounces. This Turkish towel is our top choice because the Riviera Towel Company offers a full year warranty against defects, such as running colors or fraying. If you want a stylish beach towel that absorbs water quickly and has a wide range of utilities, a Turkish towel is a great choice. Reviewers say The Riviera Towel Company’s towels stand the test of time and look incredibly trendy to boot. Read more reviews of the best Turkish towels available to purchase online. A circular towel is a fun way to spread out on the beach without using too much real estate. The Ricdecor Indian Mandala Round Towel is our pick for the best circular beach towel because it’s highly absorbent and comes in a wide range of styles to suit every personality. From stripes to flamingos, the Ricdecor features 11 designs and measures 59” across, large enough for two adults. It’s made of microfiber, which makes it light enough to transport on flights or road trips. Owners love how quickly it dries, and say it’s the perfect shape for lounging. A circular beach towel is a great choice for beaches or picnics and easily converts from a blanket to a standard towel. They’re trendy, fun and the Ricdecor’s eye-catching designs mean no more searching for your blanket in a sea of beachgoers. Our reviewers spent 15 hours testing one of the most popular beach towels out there. To make sure we’re getting the most well-rounded results, we had our testers take this towel to the beach themselves and consider its most important features, from softness to absorbency. We’ve outlined the most important takeaways here so that you, too, know what to look for when shopping. Material Look for 100 percent cotton towels — Egyptian cotton, Pima or Supima cotton, and Turkish cotton. This material is soft and much more absorbent than synthetic alternatives like polyester. Cotton blends sit somewhere in the middle of the pack — they’re less expensive, but still absorbent enough. Construction Take a look at the way the towel is stitched before making your purchase. If it has short loops, that indicates that the towel will dry faster. It also means the towel is less likely to snag. Densely woven edges — called selvage edges — is also an indication of durability. This type of stitching prevents the towel from fraying over time. Weight Though you want bath towels to have a high GSM (grams per square meter), beach towels should have a slightly lower GSM — somewhere between 400 to 600 is ideal. These towels will still be very absorbent and soft but will dry quickly and be light enough to tote. Anything less will be too thin and lack absorbency.